Between 1988 and 2006 I lived in Bermondsey, London SE1 and, in a very haphazard manner, made some photographic records of the area and, more specifically, the buildings. Bermondsey is an area of London that has seen huge change over the last decade and these photographs give some insight into the area's history. 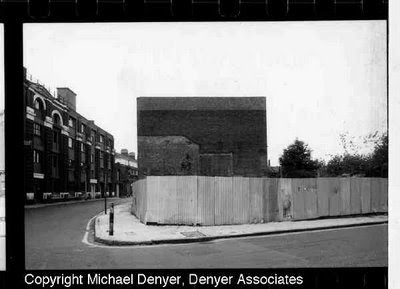 Over time I will add the images to this blog and I hope that the current residents in and around Bermondsey Street, will enjoy seeing what the area was like in the 1980s and just how far it has come. One of the most striking images comes from around 1980. Do you recognise this as the entrance to Tanner St park at the junction of Bermondsey St and Tanner St? Fantastic to see these Niall; can't wait to see more. Hope you and B are very well. Changed days. The first photo shows 4 Tanner Street before the mural went up. Whilst I worked for Southwark, I also found the 'compulsory purchase order' that created Tanner Street Park. Wonderful little bits of history. Hope you are both well. Monty is a bit wobbly and Trilby has been in the wars as well but otherwise we are good. Nice project. Every little helps. You might be interested in these links.